ISLAMABAD/NEW DELHI (Reuters) - A downed Indian fighter pilot who was attacked by a mob and then paraded on video by Pakistan's army has become a social media sensation and a hero in his homeland amid a spiraling crisis between the nuclear-armed neighbors. With Pakistani villagers and soldiers filming his capture and captivity on Wednesday in clips that have since gone viral on social media, the pilot identified by Islamabad as Indian Wing Commander Abhi Nandan has fast emerged as the human face of the dangerous flare-up between the arch-foes. India has not confirmed the pilot's identity. Indian media have given his name as Abhinandan Varthaman. The pilot and the Indian Air Force (IAF) are at the heart of the crisis between two countries who have conducted air strikes on each other's territory in the last two days. The United States and China have appealed for restraint. 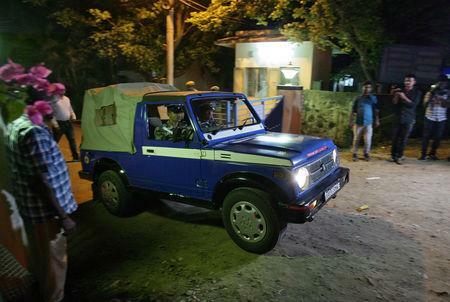 The airman's treatment at the hands of Pakistani troops drew both condemnation and praise, while at his house in southern India supporters gathered to record messages of solidarity. In one video posted on social media, a Pakistani soldier ankle-deep in a stream of water in the disputed Kashmir region can be seen shielding the pilot from angry villagers and shouting "enough" as they pummel his bloodied face and strike blows against his limp body. In another video, posted on Twitter by Pakistan's information ministry, the pilot is blindfolded and can be heard saying "I've got hurt and I would request some water". He then reveals his name and rank before politely fending off questions from soldiers by saying: "I'm not supposed to tell you that." 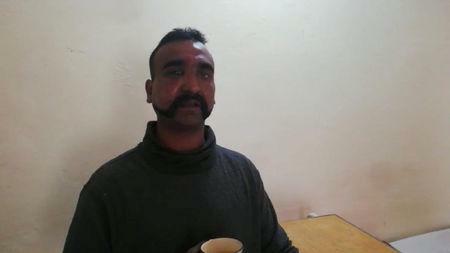 Later, in a video released by Pakistan's military, the captured airman is shown without a blindfold, appearing more relaxed, thanking the Pakistani army and sipping tea. "The officers of the Pakistani Army have looked after me well, they are thorough gentlemen," he said. 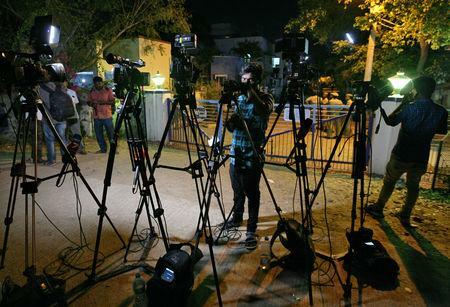 India's foreign ministry branded Pakistan's videos as a "vulgar display" of an injured airman, saying they violated international humanitarian law and the Geneva convention. "Pakistan would be well advised to ensure that no harm comes to the Indian defense personnel in its custody. India also expects his immediate and safe return," it said in a statement. Pakistan's army spokesman Asif Ghafoor tweeted a photo of the airman and said he was "being treated as per norms of military ethics". Pakistani tweeters said he had been shown exemplary hospitality. After Pakistan's government released a picture of the downed pilot, social media platforms such as Facebook and WhatsApp were inundated with old videos and photos of him. By Wednesday evening, the two top trends on Twitter in India were about the pilot, with many Indians demanding his release under a #BringBackAbhinandan hashtag. In one video shared on social media, purportedly from 2011, he is seen dining with the hosts of a popular Indian television food show. Asked about attributes important for a pilot, he says: "Bad attitude". Reuters could not verify the authenticity of the video. Many posts concerned the pilot's safety, and some expressed relief to see the later video of him clutching a cup of tea. "I Salute Our Brave IAF Pilot," said Twitter user Aarti, who changed her Twitter profile picture to one of his old mug shots.